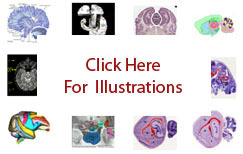 The term perirhinal area refers to a cytoarchitecturally defined area of cerebral cortex. In the human it is located in the banks of the collateral sulcus: the parahippocampal gyrus medially and the fusiform gyrus laterally ( Brodmann-1909 ); in some individuals it extends onto the medial surface of the fusiform gyrus ( Insausti-2004 ). In the macaque it is located at the fundus of the rhinal sulcus with the parahippocampal gyrus medial to it but the inferior temporal gyrus lateral to it ( Paxinos-2009a ). In the rat ( Swanson-2004 ) and mouse ( Hof-2000 ) it is located on the ventrolateral cortical surface.